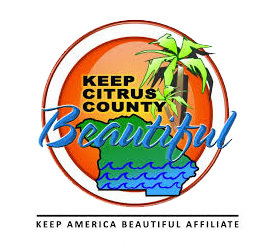 If you would like to become a Member of Keep Citrus County Beautiful for as little as $10, please complete our Membership Application and submit to KCCB Inc., PO Box 94, Lecanto, FL 34460-0074 with your applicable membership fee (please make checks out to KCCB Inc). Our Full Membership Fee Schedule is available on our Membership Application. Our MEMBERSHIP APPLICATION can be viewed/printed by clicking the link below. Monetary: Please send a check made out to KCCB Inc to PO Box 94, Lecanto, FL 34460-0094. We thank you for your support. Your Time: We can count all the time volunteers spend in planning and carrying out roadside cleanups, special waste collection events, waterway cleanups, public space beautification projects, educational events on recycling and litter prevention, reading in elementary schools and more. Contact us to find out how we can partner with you or your group to hold an event or do a project. In-Kind Donations: If you can do copying or printing, designing advertising, or if you can provide tools and supplies for projects or cleanups, or reward items for volunteers please let us know. *All donations are tax-deductible to the extent of IRS laws.